$24.15 per kit EcoColors is free of sulfites, PPD, propylene glycol, paraben, resorcinol and ethanolamine, all harmful toxic chemicals found in other hair colors. No more thin hair from overexposure to chemicals. No more drab looking hair. No more fake looks. Experience vibrant, natural-looking permanent hair color. See color chart on site menu under Hair Colors Chart & Tips. Apply nontoxic EcoColors to cover gray, add highlights or simply for shine and luster. Kit comes with hair color, developer in applicator bottle, plastic cap, gloves and instructions on how to do an allergy and strand test, how to apply color for the first time and how to apply color if your hair is already tinted. 1 kit 4 oz. Many people who are allergic to other brands do well with EcoColors. 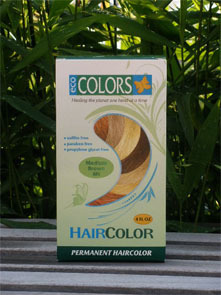 EcoColors is not totally botanical and is not hypoallergenic. If you suffer from allergies, you should do an allergy test before applying color.